Normally a demo run consists of a few burnouts, some donuts and a lot of hand waving but on a few occasions things haven’t gone exactly to plan. Here are six F1 show run disasters… and before you say it, of course Pastor Maldonado made the list. Kobayashi got his big chance to drive a Ferrari during a show run in Moscow, and he thanked the team by smashing it into the wall. To be fair to him, the conditions were pretty grim! During an event at the BMW factory at Munich in 2008, Nick Heidfeld doesn’t do the best job of impressing his co-workers after a donut goes a little wrong. Bin Sulayem may have won 14 Middle East Championship rally titles, but his experience didn’t stop him from making this embarrassing error when he got to drive a Formula One car at at the Dubai Autodrome. It’s not always the driver that gets it wrong. This crazy Japanese fan was lucky to escape unharmed after trying to long jump over Sebastien Buemi’s Red Bull. Well it wouldn’t be a crash compilation without Pastor Maldonado would it? The Venezuelan was doing a demo in his home country but it ended in… well, classic Crashtor. 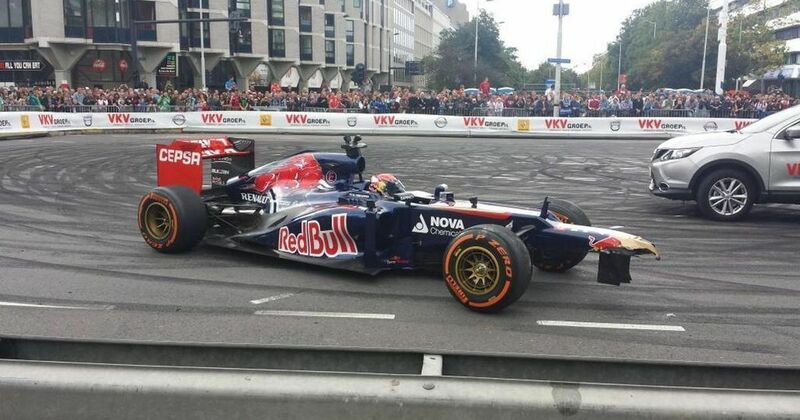 Max Verstappen was just 16-years-old when he drove a Toro Rosso in front of his home crowd in Rotterdam and after an embarrassing crash during his run, people began to question his ability. It didn’t take long for him to prove everyone wrong though.